Liczba stron: 184 Jest to ujednolicona liczba stron, która ułatwi Ci porównanie długości książek. Każda strona Legimi to 200 słów. Max Miller’s Carrier! is a riveting first-hand account of how US Navy sailors and officers lived and fought aboard an Essex class carrier during World War II. His detailed eye-witness narrative is both entertaining and informative. Published by Military Classics, 2017. Carrier! 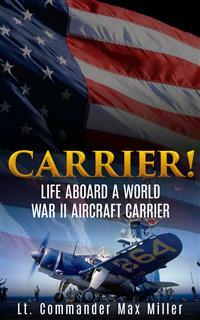 Life Aboard a World War II Aircraft Carrier by Lt. Commander Max Miller. First published as Daybreak for Our Carrier by Miller in 1944. Cover, interior design and editing © Copyright 2017 Military Classics. ON good days, on days when everything is going just right aboard, and when the planes are taking off within their few second intervals—on those days a carrier sings. She is a symphony of engine thunder and colored signals. She is a ballet almost. There are the bad days too. These are the days of discord. They are the days when the planes for no apparent reason start getting fouled on the flight deck or while being brought aloft from the hangar deck, or the elevators get blocked, or this or that, and nobody knows exactly the reason. So if one were to describe an aircraft carrier accurately he should not be too grim about her or too overly concerned with where she has been or what she has done. Such notes may be all right so far as they go, but they do not go into the heart of the carrier herself. A carrier can be so many things at once, all at once, that her very bulk and variety place her outside the realm of all other vessels we have come to know through the ages. Literature and romance already have classified Phoenician galleys, and have carried the classification on through square-riggers, through clippers, through the first side-wheelers, and on to liners and battleships. But now comes a vessel so immense that her arms reach hundreds of miles from her body. The air is as much her realm as the sea. Clouds are as important to her as depth or current. She is, in brief, a sort of fourth-dimensional creation. She is both bird and barque. She is a new thing. THIS vessel is a piece of the United States. She became detached somehow from the mainland of America, and was speeded out here. She is a piece of the best of the United States. She is out here to help offset the shortage of landing fields in this mid-Pacific. She is a movable base zigzagging between our own coasts and the coasts of the cunning enemy. Islands cannot be made to float, it is said. But here is an American-made island, and her speed can be pushed if need be to well above thirty knots. We are all a part of her, as she is a part of the United States. Copper from Montana is in her. Steel from Pennsylvania is in her. Lumber from the mountains of Washington and from Michigan and from Minnesota is in her too. A state cannot be named which is not represented in her somehow. The men aboard are from all these states likewise. We are not lonely on this carrier, for we have brought our homeland with us. We have extended our homeland to out here beyond the dateline. We speed along ever westward for a coming engagement. Exactly what turn the engagement may take, we do not know. What may be waiting for us there in ambush, we do not know either. But we have our own opinions, and we have our scuttlebutt. And we know, too, that on this attack we are going deep into the enemy's own front yard. This we know, for it has been told to us. It was told to us on the second day out. We had had our guesses, of course, as to where we were going, and these guesses had proved rather accurate. They usually do. But during that lecture in the wardroom, and while facing charts and diagrams, it had been fun pretending we were surprised. The statement that we are not lonely may be assuming too much. It means we are not lonely in the sense of being Americans on foreign territory. This is our own territory, and our flight deck is almost the size of a homeland meadow. At least the flight deck is well over the size of a city block. Men on the stern appear tiny indeed from the bow. There is no recognizing them from such a distance. Nor will voices carry that far except through the ship's loud-speakers. In the staterooms are the pictures of American women, of American girls, of American children, and of American babies. It is obvious that some of the young husbands aboard have not seen their own new babies except through these pictures. And some, especially the pilots and their gunners, may never see their babies at all. But it is best not to think of that. It is best for us instead to make this ship the fightingest ship there is, and to keep her that way. This is the trust of all those aboard. Nothing must happen to her. The flyers and their gunners are loaned to the air, so to speak, but they are still attached to us regardless of how far they go. These decks, this piece of America, comprise the flyers' lifeline, their home, their sanctuary—and their ammunition depot. And each time the flyers land aboard, when they climb down from their cockpits, when they remove their paraphernalia, it's like overhearing a splendid prayer to overhear them say: "Hot damn." A CARRIER may be a temporary innovation. Who is to know about that? Who is to know about the day after tomorrow, as measured by years, as measured by wars? It may be that carriers will have served their purpose with this immediate era. After this war they may become museum pieces. Or relics. Something to be stared at on a Sunday afternoon by crowds curious to see a floating left-over of history. Planes may be so big then, and so fast, and with such great cruising ranges, that these subsidiary landing fields, these carriers, may be inessential. But if future generations do stare on a Sunday afternoon at some preserved carrier, a hold-over from these Pacific days, the staring had best be performed with reverence. For what a purpose these carriers already have served to the nation! At least out here on the Pacific where, because of fabulous distances, carriers are so necessary. But we aboard are not much concerned with such thoughts of the future. We haven't time for that. We are too busy preparing for this next engagement, too busy checking the shells and the bombs. It's quite a lift from the pit of this ship, from the bomb magazines, up to the flight deck, up to where each torpedo-bomber or each dive-bomber receives its quota, for daily practice or for keeps. There is so much else to do too, and to keep doing, that this carrier herself, as she speeds along, seems untouched by all the arguments which have taken place ashore about her and her kind during past years. She is above all that. Her own action speaks her worth. Her own need, as she plows westward, speaks it too. What a different turn might the Battle of Midway have taken without carriers. And how much more prolonged could those dubious days have remained around the Solomons. Some of those grand carriers are dead now, sunk. But nobody, at least nobody on this task force, speaks with disrespect of those deaths. It would be like speaking with disrespect of those first terrible months themselves, those first desperate weeks. And it was right then, and immediately, when the few available carriers went out with whatever they had, which wasn't much, and helped put the stop to the enemy's tidal sweep in all directions. Our few carriers then were under-armed for this type of war. Their escorts were pathetically few. But they stayed out at sea fighting. They continued fighting. And the war on the Pacific took a right about turn. To have expected all of those carriers to come through unharmed, against such an avalanche of numbers, was an impossible hope. But the names of those carriers did not die with them. This is no figure of speech. This is literal. Their names are being carried today by their successors, which is only proper. Their names are represented in this same task force, on the offensive now, and going deeper and deeper west. Aboard are a certain number of officers and men who were aboard those first carriers which went down in fight. It is always well to have such carrier veterans exchanged or seeded around this way. It helps with ideas, and it helps prevent over-confidence and under-confidence. Anybody who has been bombed overside into a burning sea isn't fooling when he wants his next anti-aircraft battery to be the best there is afloat. Ours has been trained into being just that, we think and we hope. We are aware of how important we feel aboard this carrier. We hold no false modesty in this respect. We know that this whole task force has been built around its carriers, and that this whole engagement will depend on us. Ours is the heavy role as well as the responsibility. We realize right well that the enemy if given a chance will try to get the carriers first. "Get the carriers first." The phrase has become a bromide, although a true one, with each side in this Pacific war. And the phrase is the sincerest compliment of all. No wonder, then, that we feel our importance. Not speaking as individuals, of course, but speaking of our ship of which each of us is a part. A thousand-thousandth part of the ship, to be sure, the same as the rivets. THE signal PILOTS MAN YOUR PLANES is thrown from a teletype onto a small screen in the readyrooms, and sometimes the order also is sent over the loud-speaker into the same rooms. It is then that the waiting pilots, with whom you may be in the midst of exchanging the most outrageous of earthy stories, instantly become other beings entirely. It is almost as if they said: "Yes, a moment ago I was one of you. Now I am not." The next time you see them you will have climbed up into the ship's island to view the take-offs from there. But meanwhile they will have vanished out a rear door of the ready-room while you have gone out another. It's this sudden separation for the take-off, quite complete and quite definite, which seems to segregate them so sharply from your own realm into another realm not for ordinary people. Each laden down with his equipment (and there is a lot of it, including the chart-board, an automatic, a jungle-kit, a bag of yellow dye, a life jacket, a parachute, and so on), the pilots will have disappeared onto a dark and narrow catwalk beneath the flight deck. They will have filed across this catwalk as quickly as their loads and the darkness permit. When mysteriously they emerge again, as from a tunnel, they will be tiny strangers far across the flight deck from you. You know them, and yet you don't know them. They are different people. Even their shapes are different, and their faces. The one thing common to all of them, as they run or stride toward their planes, is concentration. There is no by-play and no joking, and no waving of greetings either. Each mounts his plane and begins testing the gadgets in it. The plane captains climb alongside the cockpits. The plane captains are enlisted men. Each has been assigned to an individual plane, and he is in charge of that one plane as long as it is aboard. He even may sleep in it at times. It's his plane. He's the trustee and guardian of it. The pilot is his pilot too. And now the plane captain assists his pilot in adjusting himself in the cockpit. There is so much to do, so many little things, and each of them of deadly importance. But this is not the proper time to describe the whole operation of a take-off, with all its roars and its hurricane of wind-streams, and with our own suspense as each plane whirls down the deck for that final leap. This is not the time for that. It may come later. This has to do, merely, with that strange moment, that quick moment, when these young men (but how old their faces seem) suddenly become transformed into different people. Within seconds they have been transformed from such as us into the magic characters of a childhood fable. And next they will be far aloft uniting with others of their own kind, their own squadrons, up there. All of this seems part of the fable too. It seems almost as if they always had belonged up there, different beings, and for the past few hours had been down visiting us as a joke. A FLIGHT deck in operation cannot be photographed truly except in colors. In the same sense that the silhouette of a carrier herself has violated all lines ever known to warship construction of the past, so too have the Navy costumes which are worn by her crews on the topside. The nickname "Airedales," as applied to these crews, may not have come into being with the war, but it certainly came into being with carriers. Even now its precise scope as a nickname has not been definitely bounded. There are those of us aboard who insist the term "Airedales" comprises all members of our carrier's air force. There are others of us aboard who insist the word is limited to those amazing youngsters who, working in teams on the flight deck, bring order out of what could appear to be windy bedlam. These crews are the ones who push the planes around. They are the ones who release the chocks from in front of the wheels. They are the ones who bound across the flight deck at each landing to release the landing contraptions while another plane is "in the groove" speeding in. They are the ones who jockey the towing jeeps from this end to that end of the flight deck, and who on hands and knees slide behind and around the whizzing propellers. And finally they are the ones who, on that wind-whipped flight deck, wear just about anything that will cling to them. What mainly distinguishes a carrier from any other type of warship is, of course, this very flight deck. And what distinguishes this huge pasturage of a flight deck from any other type of deck is that here something is continually taking place. Nor has it to do mainly with polishing brass or scrubbing down or standing by for inspection. It has to do instead with the fury of handling some pretty important horsepower which is cyclonic in nature and strength. Another name for these "Airedales," and a more limited one, is "Sheepdogs." And a flight deck would not be, could not be, worth taking to sea without them. They are youngsters. Aside from their colored and armless sweaters they wear just about anything that suits them best. For it is their own scalps which are being risked around the whirling propellers, and it is the seats of their own pants which go skidding along the deck behind the wind-streams. The trick, when about to be blown away into another whirling propeller right astern, is for the "Airedales" to swing over upon their bellies as soon as possible, or sooner, and to claw their fingers into the deck's gratings. These narrow gratings, not far apart, are primarily for use in lashing down the planes. It is doubtful if the designers had the "Airedales" in mind when these gratings were installed. But they have become as important to an "Airedale" as a parachute to a flyer. The wheels of a carrier plane have to be chocked, or had better be chocked, before the propeller is sent spinning. And these same chocks have to be removed, or had better be removed, before the flyer starts for the take-off. This is all part of an "Airedale's" work. Nor on a crowded flight deck, with scores of planes within a limited space all warming up at the same time for the take-off, is there much room for the "Airedales" between the wheels and wings and tails and propellers and extra gas tanks and bomb racks. No, there isn't much room. But whatever room there is, the "Airedales" on hands and knees and bellies have to find it. Besides, the planes are not staying in the same place. They are being signaled to their take-off positions at intervals measured by seconds. All of this may be part of the reason why it seems as if all the old clothes bags of all the attics have been plundered to supply rags and shirts and caps and shoes to the flight deck crews. An enemy propagandist, for a fact, could consider using this clothing as evidence that Americans are now down to their last shreds. But the colors of those sleeveless sweaters are something else. Whenever new batches are issued and freshly put on, the flight deck becomes a dazzling thing of reds, greens, blues, pinks, yellows—and sunburn. Each crew is given its own individual color. The purpose is not the joy of the thing, but merely that during the dizzy turmoil of handling the incoming planes, or in re-spotting them afterwards for another take-off, the "Airedale" crews may stick together. There are ten such teams, perhaps, with each member bearing the number of his team on the back of his sweater. It can be said also that a dozen or more of these youngsters comprise each team. The number is approximate, but this would be a guess when one sees them lined up one behind the other to be counted off. It must be said, too, that they don't stand in line very well. Despite all the frantic work these "Airedales" (alias "Sheepdogs," alias plane-pushers)—despite all the frantic work they have just finished doing or are about to do, work which would cause the rest of us to feel our ages by not being able through exhaustion to feel anything else, these youngsters start in pummeling each other. This pummeling soon leads to wrestling, and this in turn leads to a sort of free-for-all specifically aimed at the guy who started it. We elders, out of jealousy, may try at times to be cynical about such physical energy. We may breathe such phrases as "Ah, youth," and things like that. But there's really no use. The "Sheepdogs" have won. They've won us completely, they in their crazily colored cloth helmets, or in their caps resembling baseball caps, or in what resembles paint cloths tied around their heads, or in things resembling something never seen before. Their rickety trousers for the most part are the same way, or at least get that way by night. Even the customary sailor white hats, when they are worn at all during work, are not the customary white hats any longer. They have been deliberately dyed by their owners into a mottled and questionable blue. ONE should presumably start the description of a vessel by giving her length, and her tonnage and the date of her launching. Yet this is hardly the manner in which one becomes acquainted with a carrier, especially with a large carrier. There is a difference, too, between going aboard as a visitor and going aboard to report as a member of the ship's company. The former may look at the strange vessel with curiosity, or with the impersonal detachment of a man viewing a circus. But when one for the first time reports aboard for duty, the peculiarities of the great vessel become not so much a curiosity as a downright problem of intricacies and size. They become his responsibilities. He must learn them rather than remain entertainingly mystified by them. Nor on first reporting for duty is he presented with any gradual build-up, such as having the smaller things presented first. To the contrary, after mounting the gangway with his papers, he enters the biggest enclosure of all. He enters the hangar deck. The outside of a big carrier, when viewed from a pier, may seem big enough for anybody's world. Unless vessels of a more familiar type happen to be nearby for comparison, one may even give up trying to figure her length. But by taking most of that whole length, and by putting a lofty over-all cover and sides to it, you will have a fairly accurate idea of a hangar deck's space. The vastness, when seen for the first time from the inside, is the more pronounced because of the absence of uprights to break it. The hangar deck simply goes on and on, and over it all, and far above, is the flight deck which may as well be the sky.